"We've learned this year that you pick up a lot more than snow," said Boston Public Works Commissioner Mike Dennehy. Video of the lot on Terminal Street in Boston's Charlestown neighborhood was taken Wednesday. By Friday, the city was able to tackle the trash concerns after three days of work, but it is still in the process of repairing the damage caused by the large equipment and weight of the heavy snow and ice. The lot is just one of 11 snow farms the city was forced to use this winter. Dennehy says so far, Charlestown is the first one at which they've been able to make significant progress. "We've done some math, we lost 3,200 tons of trash from our residential trash and recycling collection in the month of January and February," he said. "We're seeing some of that appearing now as the snow farms begin to melt." According to Dennehy, about 30,000 truck loads of snow were dumped at the Tide Street snow farm in the Seaport District. Friday, the pile of snow there is still four stories high. Underneath it is more garbage and debris than the city ever imagined. Dennehy says there are crews assigned to surveying and removing the debris there once a week as they slowly try to chip away at the massive pile. This week alone, he estimates they removed more than 16,000 pounds of debris. "The office has a pool going on when it when it will be completely disappeared," said Blake Goodwin, who works nearby "I think my bid was June 6." Both the Terminal Street snow farm in Charlestown and one at Franklin Park are primary focuses of the city since they are abutting areas used by the public on a daily basis. 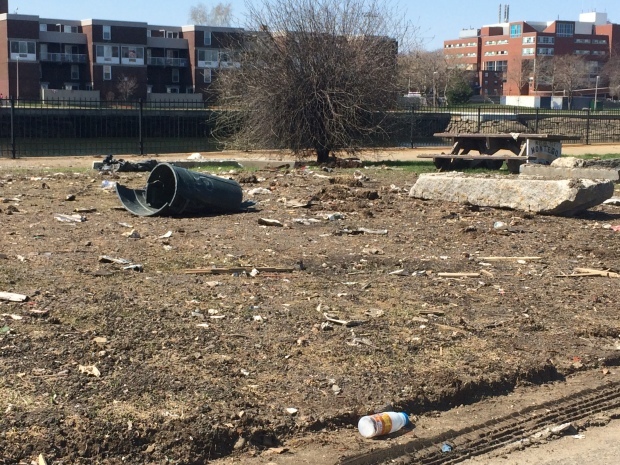 "We want the kids to be able to play and not worry about all of the trash that's left over," said Emily Landry, who was visiting Franklin Park Zoo. But clearing all of the snow farms will take time, resources and, of course, money. 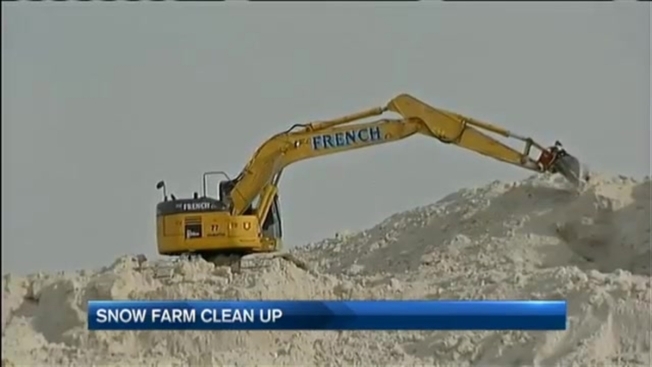 "This is the first time we've ever had to focus on cleaning snow farms on a regular basis," said Dennehy. The commissioner says it's almost impossible to put a price tag on all of this right now, as the city needs to wait for all the snow to melt. He says that for a snow farm like the one on Tide Street, that could take another two months.